Jan - 23 | By: zikri | No comments. 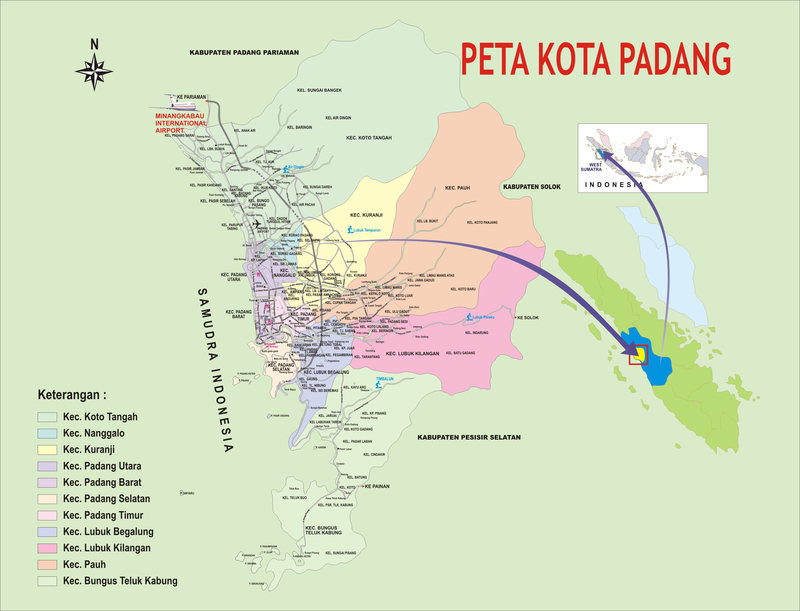 Tour de Singkarak is the international event for bicycle race at West Sumatera, Indonesia. Tour de Singkarak aim is to provide a memorable sport tourism experience as the tour combines bicycle race and tourism, in order to inspire the imagination of champions and excite enthusiasts throughout the event. 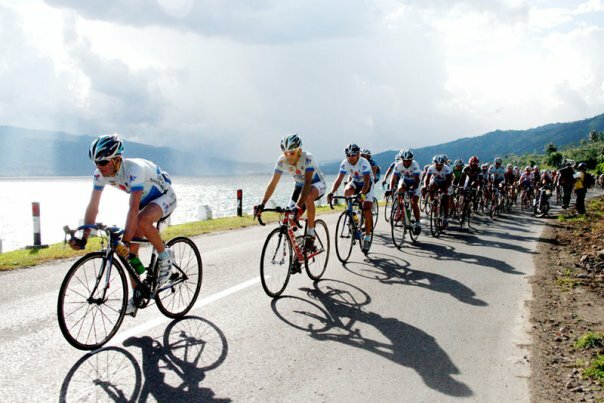 Successful conduct of international cycling event “Tour de Singkarak 2009”, will be started again with the advanced series held “Tour de Singkarak 2010″ on June 2010, a more vibrant, lively and weighted. This event had already attract 20 countries beforehand only 15 countries, which they use the Stage Longer divided into 7 Stage before the race that only 4 Stage. The route is also longer than before. It is about 700Km with 6 or 7 spending days. From Maninjau to Bukittinggi participants will also be challenged through the winding streets of the most famous beauty kelok 44. Start at the Padang, the participants will stay in Maninjau and Bukittinggi. They will race a sprint from Padang Panjang to Bukittinggi. Towards Sawahlunto participants will pass Tanah Datar region and finish in the Singkarak. This event will also be enlivened with a variety of attractions arts in a number of locations. Such as Maninjau and Tanah Datar. Sep - 25 | By: zikri | 1 comment. Pacu Jawi is a game typical village in Tanah Datar. Pacu Jawi in Tanah Datar held specifically for the fields and rider come running with jawinya. 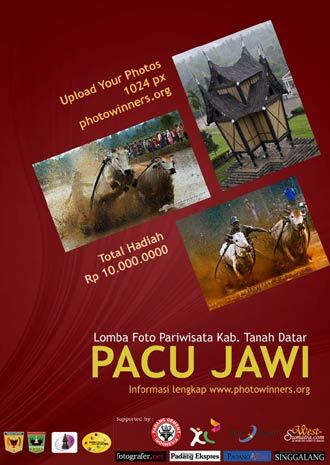 In order to preserve and promote Alek Nagari Nagari ” Pacu Jawi ” Culture and Tourism Department of Tanah Datar District Photo Contest held Pacu Jawi Year 2009. With the invented this race is expected to be Pacu Jawi activities better known, both at national and international levels, and ultimately will increase the number of tourists visiting the Tanah Datar LUHAK Nan Tuo. Open to the public (Committee, Ladies and family not allowed to follow the race). Theme photo: Race & Procession Pacu Jawi. One of the participants can submit a maximum of 8 images. Digital Engineering is not allowed, there must EXIF data. Image size 10 R and submit softcopy on CD, JPEG format with a minimum image size 5 megafipiksel. For images created with film must include the original cliches. Behind the photograph must be posted that contain data data title image, photographer’s name and address, Phone number / HP. Sign up for free www.photowinners.org. The size of the longest side of max.1024 pixels high resolution. Photo of the entry will be judged by a jury on June 6 and 7 November 2009. Photo assessed by the jury is a photograph signed / sent by site www.photowinners.org. Winners will be announced on the site www.tanahdatar.go.id, www.photowinners.org, www.west-sumatra.com and Daily Padang Express. Photo contest winners are nominated and will be exhibited on the 12th, 13th, 14th November 2009 and names and award winners will be conducted on November 14, 2009 at the closing exhibition of Batusangkar. All photos belong to winners of the committee and the committee has the right to use as a tourism publicity materials, without having to ask permission first. For the photos that did not win, but a time will be used for publication, the Committee will contact the owner of the photograph.